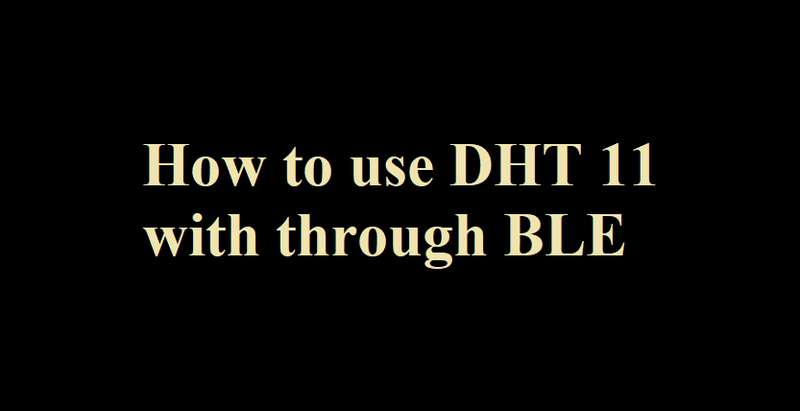 In this tutorial i am telling to you How To use ESP32 BLE with DHT11. You need to have the ESP32 add-on installed on the Arduino IDE. Follow one of the next tutorials to prepare your Arduino IDE to work with the ESP32, if you haven’t already. The program basically sets the UUID of the UART communication service, it reads the humidity and temperature of the DHT sensor, and transmits this data to the application on the mobile phone. Data is sent in a single variable, but in a CSV format, with temperature and humidity separated by a comma. const int LED = 25;  // Could be different depending on the dev board. I used the DO32 ESP32 dev board. // test if return is valid, otherwise something is wrong. pCharacteristic-> notify ();  // Send the value to the application! Now Open BLE Scanner Android App and connect with “ESP32 DHT 11” and click on UUID “6E400003-B5A3-F393-E0A9-E50E24DCCA9E for Notifictaion. Use UUID_RX “6E400002-B5A3-F393-E0A9-E50E24DCCA9E for write data. send A for turn on led andsend B for turn off led. OR you can use nRF Connect for Mobile App.